A strategy map is a tool for visually displaying the position of a company or a line of business relative to competitors. 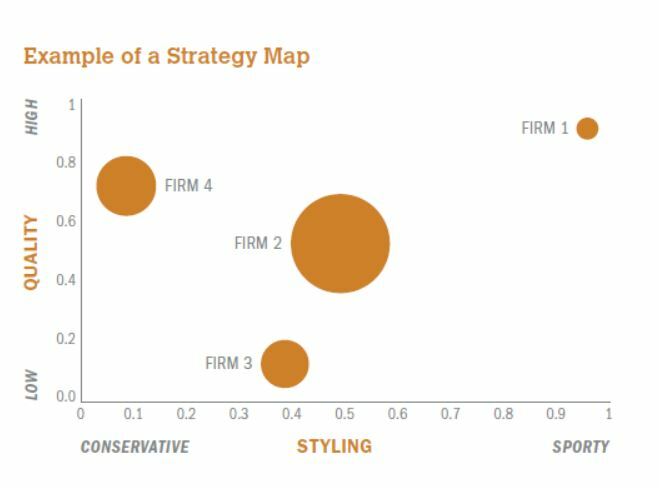 Strategy maps generally place firms based on two or three dimensions that capture either critical elements driving consumer preferences or important attributes characterizing competition. In general, there are two types of competitive advantage a firm can pursue: low cost or uniqueness. Using a low-cost strategy, a firm simply tries to have lower costs than the marginal producer in the industry. With the uniqueness strategy, a firm tries to persuade customers to pay more. A uniqueness strategy usually entails offering products of higher quality or with more features than other products in the marketplace. Firms may choose to target a broader or narrower segment of the market. Broad-scope firms tend to deliver products and services that appeal to a wide number of these segments. 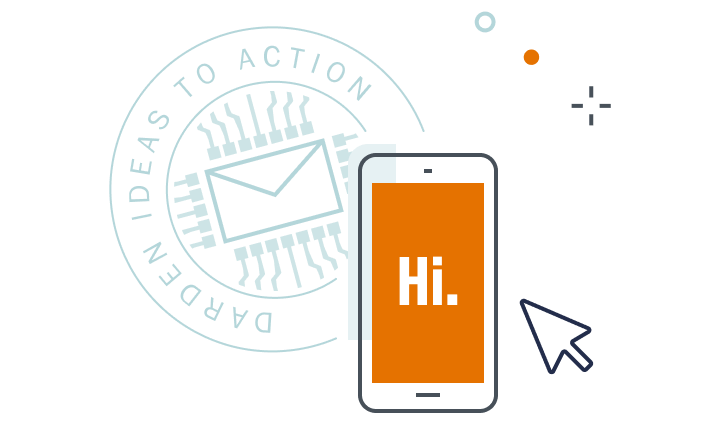 They may do so by offering individual products and services with broad appeal or by offering a portfolio of products that cover the product space. For example, Henry Ford’s Model T automobile was built with a broad target market in mind: people who wanted a simple, affordable car. Alternatively, General Mills offers a broad array of cereals to try to appeal to each market segment. On the opposite end of the spectrum are narrow strategies that target one or a few market segments. Porsche manufactures and sells high-end sports cars to a narrow segment of affluent automobile owners. Nature’s Path Organic sells healthy cereals to a narrower, environmentally and socially conscious consumer base. Broad-scope, low-cost players are referred to as cost leaders. Walmart is a classic example of a company trying to appeal to a wide audience with the lowest-cost products. Cost leaders typically engage in aggressive cost-cutting, build market share to gain economies of scale, use low-cost inputs and labor, minimize overhead such as R&D, and invest in low-cost, state-of-the-art operations and continuous improvement initiatives. Broad-scope, unique players are referred to as differentiated players. The Target Corporation is illustrative of this strategy. A mass-market retailer, it offers higher-quality products in a more refined setting (and at higher prices) than Walmart does. Differentiators often invest heavily in advertising to build brand awareness, develop innovative capabilities to stay on the cutting edge, and invest heavily in human resources and other ancillary activities. On the narrow side, we have both focused, low-cost players and differentiated niche players. Kia entered the U.S. market as a focused, low-cost auto manufacturer — offering a narrow line of low-cost cars to a limited market. On the flip side, Tesla was a new entry into the U.S. automobile market with an electric-powered sports car — a higher-end vehicle costing over $100K and appealing to a narrow set of environmentalists and technophiles (not to mention celebrities). Some firms pursue generic strategies that cross these boundaries. Toyota is a classic example of a company that has simultaneously attempted to be both low cost and high quality (i.e., unique). Some argue that firms do so at their own risk, however. More often than not, these firms get stuck in the middle — being neither the lowest-cost player nor all that differentiated in the market. The first step in generating a strategy map is to determine the dimensions. Dimensions can be any factors that help define competition within an industry. These may be based on product styling, such as the conservative versus the sporty automobiles or luxury versus mass-market leather goods. They may be based on price. In other words, low versus high, or they may be based on capabilities or technologies common in the industry, such as microbrews versus mass-produced. Dimensions that capture basic competitive indicators may be used (e.g., revenues, market share or earnings). The second step is to assess a firm or one of its product lines on each dimension. In the best case, this can be done quantitatively. For example, price is a dimension that is relatively straightforward to map. Other dimensions might require customer surveys or expert opinions to quantify and map, as when customer perceptions on quality or customers’ loyalty ratings are needed. As a last resort, analysts may elect to assess firms and businesses based on their intuition or knowledge of the industry. Step 3. Create a map. The final step is to place firms on the map based on these assessments. Creating two-dimensional maps is straightforward. You can create three-dimensional maps by using circles to represent the third dimension — the larger the circle, the greater the value on that dimension. The template below gives an example of a three-dimensional map of the auto industry. The two main dimensions for analysis are the degree to which a car model is conservative versus sporty and the quality of the vehicle as measured by defects. The third dimension is represented by the size of the circle and captures the revenues for each car model. This map conveys some valuable information. For example, you can identify the competitive position of the various firms and their apparent strategies. Firm 1 is relatively small and has positioned itself to sell high-quality, sporty vehicles — a classic niche strategy. Firm 2 is the market leader, selling large numbers of vehicles to a presumably broad audience. Firm 3 seems to be pursuing a low-cost strategy, selling vehicles of average quality. Firm 4 may be pursuing a differentiated strategy, perhaps targeting an older consumer base and selling higher-quality vehicles with conservative styling. 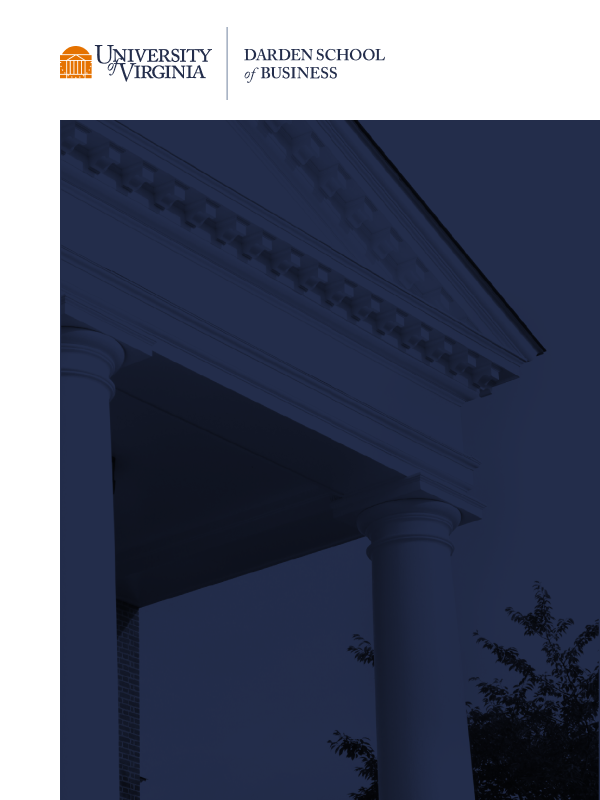 The preceding is excerpted from Professors Harris and Lenox’s book The Strategist’s Toolkit (Darden Business Publishing), available from Darden Business Publishing and on Amazon.com. Professors Harris and Lenox teach Coursera’s Business Strategy Specialization online courses. 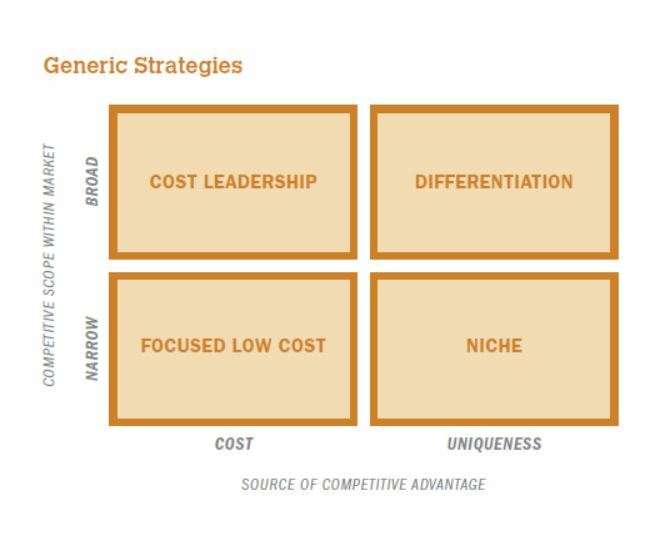 [i] Insights on generic strategies draw from the ideas in Michael Porter’s Competitive Strategy: Techniques for Analyzing Industries and Competitors (Free Press).